1. Twelve pounds of organic onions. 2. Six pounds of organic carrots. 3. Several heads of organic garlic, all beginning to sprout. 4. A small but colorful mix of the very last garden tomatoes, rescued weeks ago and now looking rather pathetic and shrivelly (but in no way ready to be fed to the chickens). 5. Seven cups of luxuriously rich, homemade chicken stock taking up an entire (much needed) shelf in the refrigerator because I am out of little plastic freezer containers. 6. A couple dozen beautiful escarole plants still thriving in the garden but threatening to freeze to death at any moment. 7. A bag of tiny organic lentils staring up at me from the kitchen counter because they were too cute to stash away in the pantry. So I ask you, what would you have done? That's what I thought. Soup. This is a thick, quiet soup that is not full of herbs and spices and flavors that jump out at you. It is subtle. At first I wondered if it needed to be livened up a bit, but after about a dozen test spoonfuls (I'm serious), I realized that it was absolutely fine just as it was. You can, however, use it as a starting point to create all sorts of flavorful variations. For instance, next time I will definitely be adding much more escarole. I put in two large handfuls (that weighed about 4 ounces total), and I think it could have used at least twice that much, if not more. You could also substitute other greens, such as one of those handy bags of organic baby spinach or some nice kale (though you may need to cook the kale a bit longer). I like my soups blended so that they are thick, and while I was inhaling those twelve test tastes, I found myself staring into the pot, trying to find any sign at all of the tomatoes I knew were in there. That's when I had a Very Interesting Revelation: You could hide all kinds of stuff in this soup. Just blend it up, and your picky little (or big) eaters will have no idea that they are happily slurping up a dreaded carrot or tomato--or even spinach. I could barely even make out the escarole in this batch. Now don't feel guilty. This is not being sneaky; it is being smart. Plus sometimes there is just no way you can eat all that escarole yourself. --Add a lot more carrots. --Add a lot more garlic (and roast it first). --Use fire-roasted and/or flavored canned tomatoes. --Use water or vegetable stock for a vegetarian version. --Stir in some cooked shredded chicken after you blend it up. --Garnish it with a dollop of sour cream. --Add your favorite herbs or spices, such as rosemary & thyme or even curry powder. --Make it a Mexican meal by adding cumin, coriander, and a jar of green tomatillo salsa to the soup, then garnish it with shredded Jack cheese, diced avocado, chopped tomatoes, fresh cilantro, and sour cream (this would be good with the shredded chicken added, too). Serve with tortilla chips. --Slip in any veggies you can't get people you are feeding to eat otherwise. I think you get the idea. It is hard to go wrong with lentil soup. All that and it is good for you, too. And of course it is even better for you (and everyone else) if you seek out locally grown and organic ingredients. Enjoy. Heat olive oil in a large pot on medium. Add onion and carrots and cook about 5 minutes, stirring so the oil coats the vegetables. Make a space in the bottom of the pan, add the garlic, and cook for another two minutes, stirring constantly, until the garlic is cooked but not brown. Add the lentils, tomatoes, and chicken stock and bring to a boil. Simmer, with the lid cracked, for about 45 minutes. Stir every now and again. Add the chopped escarole and cook another 5 minutes. Carefully puree about half of the soup in a blender on low speed until still slightly chunky, then return to the pot. Or use an immersion hand blender (I'm crazy about my KitchenAid Hand Blender) to puree the soup to desired consistency. Cook over medium heat another five minutes. 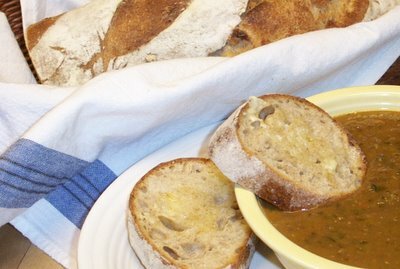 Serve hot, garnished as desired, and preferably with some kind of yummy bread, such as a crusty sourdough or a loaf of my Beyond Easy Beer Bread. (Just mix up the batter while the soup is coming to a boil, and you'll have hot, fresh bread ready when the soup is.) This soup keeps well for a few days in the refrigerator and freezes beautifully—assuming you haven't run out of freezer containers. © Copyright FarmgirlFare.com, the award-winning blog where Farmgirl Susan shares recipes, stories, and photos from her crazy country life on 240 remote Missouri acres. That is most definitely being smart. I love lentil recipes. Thanks for another one! I haven't had anything with lentils in ages. Just delicious (and wintry!) looking! LOL, this soup is perfect! I love the name. I'll have to give it a try. I've got an inordinate amount of root veg and a stash of french lentils. Thanks! Wow, what a great soup! I've just printed it out. I'm the same way...I'll eat just about anything, if it's pureed into oblivion...I just don't want to see/feel the other stuff. I eat things I don't necessarily care for, because it's good for me. I'm more likely to do it in dishes like this...so thanks! Bee-yootiful. And you promise the Beer Bread is that fast and easy? Because I just might try it. Wow that looks so good. I am very unhappy to be sitting here at 2:42pm at my desk. That means nothing to satisfy that growling in my stomack except for a bag of chips. Over Thanksgiving I showed my MIL the before/afters of the soup you blended several entries ago and murmured something along the lines of even though I purged so many gadgets, maybe this one isn't so bad after all! Since she enjoys keeping me in all things Kitchenaid, there just might be one stuffed in my holiday stocking this year! I owe it all to you! I made lentil soup when I was in France but our kiwi crew mate apparently never had it and he said yuck.. bugger it was earthy yummy just comforting. hi, farmgirl. i'm lydia. i was referred to your blog by my sister-in-law at zen foodism. i made your other lentil soup with italian buffalo sausage-- it was the only ingredient i had to buy. most of the other ingredients were approaching desperate shape. my carrots had already given up on human consumption and thought they were heading for the chicken house! my husband put on an orgiastic display when i served it to him with a whole wheat herb bread roll. he almost broke his bowl, he was smacking that spoon against it so hard. It's definitely a tummy warmer! Glad you like the name. I couldn't resist. Let me know how your version turns out. Thanks. I think you could pretty much hide anything in this soup! I promise, promise, promise that the Beer Bread is that fast and easy. You should definitely try it. Just make sure your baking powder is fresh! I wouldn't have even known there was an endive/escarole issue if it weren't for you. I'm glad I got it cleared up for me, too! Your place sounds wonderful--and you seem to have done a lot already. Riding mules? I'm so jealous. I doubt Dan will ever let me ride him, though maybe some day he'll put me around in a cart, LOL. I will try to think of some homesteading blogs. EarthHomeGarden (http://earthhomegarden.blogspot.com) is one, and they are in Southern California. http://www.othalaacres.com/homesteading/00-links.html that looks pretty neat. You can always try a blog search (you can even use the search option at the top of this blog but choose to search all blogs). Or you can search on a site like http://technorati.com. Just put in key words like "homesteading" "dairy goats," etc. and see what you come up with. Best of luck to you. I hope you'll write again soon. Sounds yummy! Lentil soup sounds perfect this for this snowy day in Boston. I love how lentils cook fast and are so versatile. Anyway, I've been enjoying your blog for awhile now, but I had to comment today because I made your beer bread recipe for the first time yesterday. Dee-lish! I made it with all whole wheat pastry flour because that's all that I had on hand. I added about 2 t. dried oregano and 1/2 c. shredded cheddar. It was hard to resist pulling it out of the oven for a sample - the smell was heavenly! I just discovered your site and tried this recipe right away. It was great! I just had it for lunch again today. Thank you! Thanks for this one I am going to try tonight. You are marvelous as usually! Where do you find such amazing ideas! I just adore your soups! I love lentils and am going to try this and your other soup with sausage. I think I will add some brussel sprouts to this as too as I love them as well.